I finally finished my 3d spider tutorial today. He is not posted yet but will be over at 3d beading soon. This has been a long time in the making and I am glad to start my new year off without this "monkey" on my back. This has also been a long time in the making. I thought designing the site would kick me into high gear to start selling things but I forgot about Christmas so that pushed everything back on my site. The last thing I did was make my new year's resolution, well I am doing that now so here goes. 1. No more starting something unless I plan on finishing it. I have enough unfinished things to keep me busy for 3 lifetimes. 2. I am going to stop saying yes to everything that is asked of me and start only saying yes to the things I want to do and that make me happy. 3. I am gonna remember that it is ok for me to put my needs first and that is something I haven't done in a long time. 4. I am gonna relax a little and have more fun. Ok I think that does it for me. Simple, easy and things I should be doing anyway right? I have a feeling this is going to be a much better year and I can't wait! Ok so I have gotten a little crazy with my bead storage lately and had to share the neat finds I found the other day. I normally use snap and seal plastic boxes because I don't have a set area for storing my stuff and it ends up being packed into a backpack to stay safe from my kids knocking things over and such but lately I have moved to a new stoarage system. Mike got some peppermint bark last year for Christmas, I thought the tin was way to cute so I kept it. About a month ago, I needed another storage box for some new beads I bought so I grabbed the tin and the rest is history. And then my coworker was cleaning out her desk and was going to throw away her altoids tins, nope they came home with me along with another tin of cheese straws someone else brought in. But the neatest ones I found are the smackers coke container, it came with 5 lip glosses so I talked my daughter into buying it with me, she got lip gloss, I got the cool tin. Then I found the Willy Wonka suitcase tins at the dollar store and heaven, bought one of each! So I will be on the lookout in the new year for cool new tins to add to my bead storage collection! 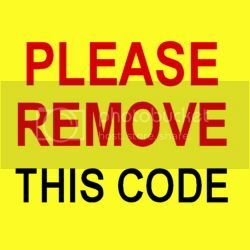 I am trying to see if I can fix my link issues, so I thought I would try and see if using tiny url would help. I am trying it the normal way too. Ok I am editing this post to try again. Yay it worked when I typed it in manually! Ok I have not gotten much beading done over the weekend. I did have some computer issues, my cd/dvd drive is no longer working and since my warranty is up in like two weeks, the computer went in to get fixed. They sent me home with a loaner so Yay I am still online. I just finished installing the software I can't live without. AVG antivirus, open office suite, inkscape and first and foremost, firefox cuz IE is yuck yuck yuck, lol. I know its all in my perception. Now that I am back up and running, I have a happy announcement to make. My wonderful dear friend Allegra has asked me to be a moderator for her site, www.3dbeading.com I am totally stoked to be able to be a part of her site (and I know my links aren't working here but the link is 2nd on my favorite sites to your right). I found her site earlier this year and have been glued to it ever since. Even better, she has become a great friend! 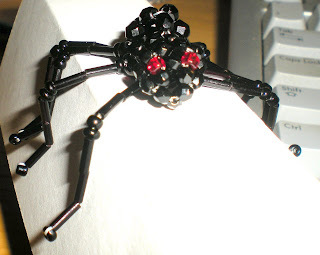 I also created my own 3d spider which I will be writing a tutorial for to post there. The second neat thing is that I got my yes we did Obama bumper sticker in the mail today so I can finally make the Obama ornament featured here ( http://margotpottertheimpatientcrafter.blogspot.com/2008/12/impatient-crafter-free-holiday-craft.html ) I know bad links but cut and paste people! Plus you can get your own vinyl sicker at MoveOn.org. I will keep you updated to when my spider tutorial is up but in the mean time, here is a sneak peek at what he looks like. I just found this neat Rainbow at The Jewellery Goddess's blog. I think it's really accurate for me too. Your rainbow is strongly shaded green and white. Yes that's right, my ornaments are FINISHED! And what, pray tell, do 53 hand made beaded ornaments look like you ask? Well they look like this. Ok so they are in the tin because I really can't stand looking at them at this moment (and because I have become a collector of tins lately and love stashing my beadwork in them.) I needed something to keep them out of my sight! It seems like all I have done for the last few weeks is make ornaments. I did pull out a few so you can see them better. So all that is left now is to pick up two gift cards and ship tomorrow morning. Mike will be doing that before he goes to work at noon. Oh and we still have to wrap presents for our kids. That will be fun this year. I scored big time today when we finished shopping. Mervyn's has about 8 days left before they shut their doors forever. I have already experienced this sadness once as they closed in Oregon a long time ago. I love Mervyn's sales. Something is always 60 or 70% off and the clothes are a lot better quality then shopping cheap. I am not one who buys name brand but Dickies jeans last a lot longer on my 8 year old son than the cheap jeans from Wal-mart and Target and if I can get them for the same price, I am going for the Dickies! While I am sad and praying for all the employees who will be left without jobs, this came at a good time for us this year. We were still wearing shorts to school a few weeks ago. I love the weather here. But we had to pull out the pants and long sleeve tops and low and behold, everything from last year is a few inches too short! The girls can manage but my poor son just won't wear capris! LOL The kids are loaded with new clothes now, I even got my husband some south pole jeans for $14! I think it is going to be a good Christmas and the first one I can proudly say I am ready for! No wrapping presents all night Christmas eve, WOOOHOOO! Ok I am about halfway done with making Christmas ornaments for my coworkers. Wow this was a big undertaking. I don't know if I mentioned this or not but I work in two departments so that means I am making 50 ornaments. Yep, you read it right 50. I have right around 25 done. I cheated a little bit and bought three kits of snowflake ornaments. Each one is supposed to make 14. It came with plastic beads, just not my style so I am having fun making each one unique from my stash of beads. It has really helped with my time being able to get them worked up so quick. And it came with these cool little stoppers to put on the end so I don't have to wrap each one. They are short so it would have really been a challenge but they were the only forms I could find on such short notice. Ordering online would not have gotten them here on time. I also still need to make my sisters and mother in laws necklaces tomorrow night in order to get them shipped by Thursday morning. Tomorrow morning I am set to finish my shopping while the kids are in school. Then of course we get to work in wrapping time too! Ugh this list is daunting! I need a nap just reading it. Ok back to work on more ornaments. I will post some pics if/when I ever get them finished! 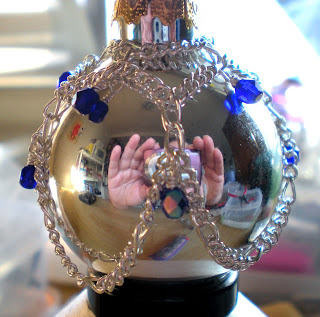 Oh some good news too and I have to give some link love to Margot Potter, the impatient crafter. I am the lucky winner of a wonderful set of beads from her blog. YAY, getting beads in any way is always a great way to make my day! Check her out at http://margotpottertheimpatientcrafter.blogspot.com/ (sorry my links aren't working for some reason so you will have to cut and paste but trust me, well worth checking out!) She also has some great crafty quickies on her site. I have learned everything on my own so its a great resource to learn proper techniques. My co worker mentioned a few weeks ago she had been given some old beads from someone cleaning out their house a few years back. She knows I am bead crazy so when she came across them, she asked me if I liked them and said she would bring them to me. I was absolutely thrilled when I opened the bag she brought me today and found this inside. I have always wanted to buy some older beads just to have. The packaging is neat, the prices crazy and it's just cool to have a piece of bead history. These packages have been sitting in someone's attic for years. The dates on the packages that have writing are all in the 60's. I have only known beads to come in plastic tubes, all of these are glass with corks. They have been untouched for so long that the cork actual broke off of the tops of a few as I was trying to open them. Here are a few pics of the packaging that I think is just grand to have! The back of the package with the copyright date. This one is my favorite packaging so I had to include a picture. I will be making my co-worker a badge holder for bringing these to me, I want to include some of the beads from this stash so I will post a picture of her thank you gift when I get it complete! Now I am off to finish dinner and tomorrow is set aside for finishing presents and getting Christmas cards finished. I have my scarves complete but I need to make ornaments for my co-workers (like fifty so nothing impressive but at least thoughtful!) I also have two bracelet/necklace combos that need to be done but I don't have the gemstones for those. I plan on shipping next Wednesday the 17th so I have a little bit of time. Wish I would have had them all done last week when I had to drive to Oregon. Oh well. Great day, photos are up and I have new earrings on the way! LOL I just got so carried away I posted this blog blank the first time! I was working on getting my photos up tonight on this blog and I realized that I am much better at making jewelry then photographing it. I would have to say that it is a little harder to do where I am because I hardly ever get overcast days. I am in San Jose so the sun is always out. Great for me, bad for my photos. I did manage to get a few ok ones, a better camera definitely helps. I hope you get a chance to check them out. The link is on the right under my photos. My website will be up and running by after Christmas I have decided. If you see something you like and or want in my photos or something you would like to have made, e-mail me about it and I may be able to squeeze it in. There are a few more presents I need to work on and also I am making ornaments for my co-workers this year. Not fancy ones but snowflakes in different styles and maybe some simple but pretty ornament covers. Plus I need to help my loving daughter finish her Egypt project this week. I am off to Wal-mart tomorrow for plain white fabric, puff paint, cardstock and gold spray paint. I wanted to do some beading with her but with my unexpected drive to Oregon and back this last week, that is not going to happen. Speaking of Oregon I am including some random shots from our trip home. My five year old rode with me and she took over 150 photos on our way home! Don't ask where exactly other than I-5 between Lebanon and where I got onto I-505! Except for the bird chasing shots and the snowy mountain as she calls it. That is a Weed airport and the snowy mountain is Mt. Shasta. They are giving away a different item for twelve days made by different artists. There are a few days left so go check them out and leave a comment. I will be getting Snowball Earrings created by juiceglass from day five! My husband thought I was going nuts when I got the e-mail, I was making so much noise. Now for pictures, and there are two more I know where they were taken, one of my dad and Jordan and one of my sister and Jordan at my moms house. We made the drive to Oregon on Wednesday and back on Thursday. I am a little miffed because I tried really hard to do as much as I could for my Bro in law and his family and it appears that we got taken advantage of. They weren't honest with us about a few things and that really makes me mad. Anyways not going to vent here. I wanted to let you know I will be working really hard in the next week to get my website up and stuff for sale. Also more pics of stuff I made. My DH has been promoting me but I am falling behind! I will be posting an album link here sometime this weekend and hopefully my website will be ready by then. I hope he knows that by promoting me and pushing me to get this done, he will be doing a few extra chores! Good thing he is a good sport! So my stranded family is still stranded. We have figured the best and cheapest solution for them will be for me to drive them back to Oregon tomorrow, my days off are Wednesday and Thursday so I have two days to make it from San Jose, CA to Lebanon, OR. That is a little over six hundred miles, each way. I will be driving there with my bro in law, sis in law, their two year old and my five year old Jordan. She is coming because I couldn't find someone to watch her after school on such short notice. My other two have after school stuff till Mike gets home so they will be ok. I am crossing my fingers for a safe and fast trip! The pass is clear and no snow is predicted for the next few days so pray it stays that way!